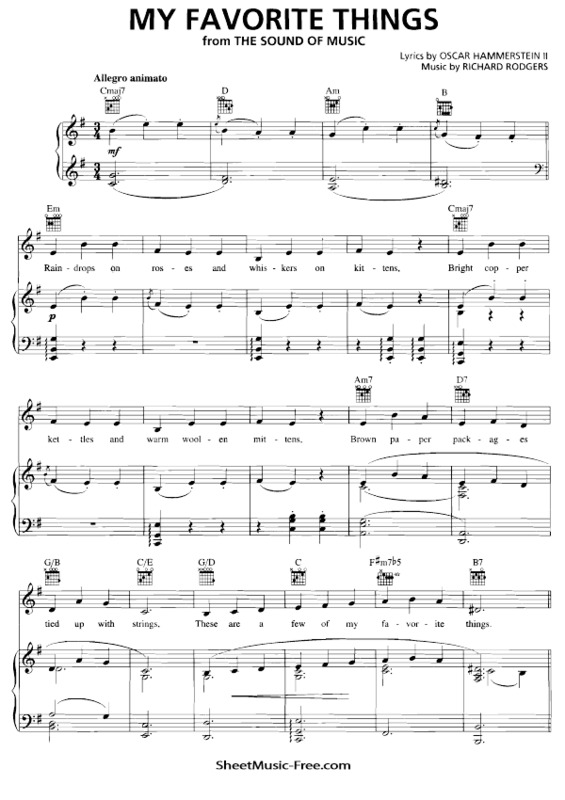 “My Favorite Things Sheet Music” by The Sound Of Music, “ My Favorite Things Sheet Music” for Piano / Vocal/ Guitar Chords , Original key: E Minor, number of pages sheet music PDF: 4, Video and Lyrics song My Favorite Things Sheet Music. “My Favorite Things’” is a popular song, originally from the 1959 Rodgers and Hammerstein, musical The Sound of Music. The song was first performed by Maria (played by Mary Martin) and Mother Abbess (Patricia Neway) in the original 1959 Broadway production. Julie Andrews performed the song for the first time on the Christmas special for The Garry Moore Show in 1961, and then she starred in the 1965 film. From the Album: musical The Sound of Music. My Favorite Things Sheet Music The Sound Of Music.